Will a Stair Lift Work On My Stairs? The answer in most cases is, “yes!” Stair lifts can be manufactured and installed to fit the overwhelming majority of staircases. One of the major factors that affect the price of your stair lift is the type of stairs you have in your home. 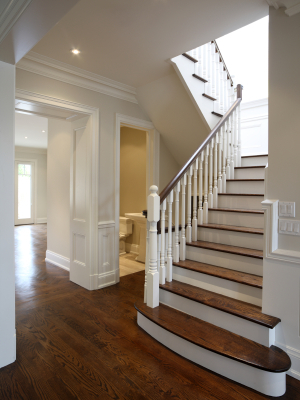 A straight staircase is obviously the easiest and simplest to install and therefore, the least expensive. When your home has a staircase that makes a 90 or 180-degree turn and has a landing in between, these are the next easiest, but require a two chair lift. Many people will ask why they need two chairs for this type of situation. Basically, due to the angle of the track, it is very difficult for the chair to maneuver safely around an entire turn without the use of a custom track. A custom-made track will raise the cost of installation dramatically and is why we recommend the two chair system. The most difficult of all stair lift installations is for a curved staircase. These types of installations require an expert and should not be attempted without a trained professional. Doing so may result in an unsafe stair lift, which completely negates the purpose of having a stair lift in the first place. In a curved stair lift installation, the track sections must be accurately bent and joined to ensure a safe ride up and down. Some of these types of installations can cost up to $15,000. One of the drawbacks to having a custom-made stair lift is that they can be nearly impossible to sell; if the time ever comes that you no longer are in need of a stair lift. Standard stair lifts with straight tracks can usually be sold relatively easy because of the ease of which you can add or take away extensions and modifications.